It’s safe to say that the secret is out regarding three-star 2020 defensive end Josh Griffis. Griffis, who committed to Florida all the way back in September of 2017, was one of the standouts this past weekend at the Under Armour camp in Orlando. “I think I did a lot better than I did last year,” Griffis said regarding his performance at the Under Armour camp. “I improved a lot from before I moved to IMG. The coaches have improved my game and taught me a lot of technique. Griffis was asked if he feels more attention is starting to be placed on him as opposed to the last few years. Griffis, (6-feet-5, 230 pounds) who currently attends IMG Academy in Bradenton, is part of the Gators 2020 class. 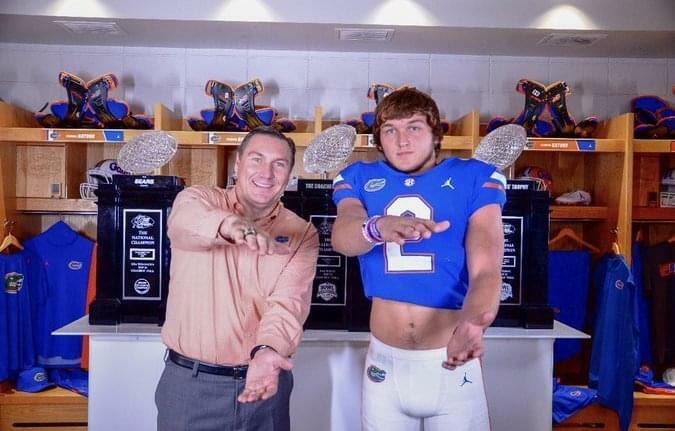 He did take notice to what Mullen and the Gators did with the class of 2019. Griffis says his relationship with both Mullen and Gator defensive coordinator Todd Grantham are strong. “I talk to (Mullen) a lot and Coach Grantham a lot,” Griffis said. “I went up there last weekend and Coach Grantham sat me down in the meeting room and he showed me what position they would have me playing, outside linebacker, standing up on the end. What type of player are the Gators getting in Griffis? “With me they’re going to get a player that is aggressive and fast,” Griffis said. “That’s what I like to base my game off of. I think to be a good football player you have to be aggressive because that’s what I’ve always been taught. Griffis likes the way the Gators 2020 class is starting to come together. “I’m really excited because we have a lot of talent in our class,” Griffis said. “We have a lot of hard workers. I’ve been to camps with them and I’m really impressed with how they play.